My voice is featured in Librivox.org’s Short Poetry Collection 062 reading The Highwayman by Alfred Noyes. You can enjoy this and other lovely poems read out loud by brilliant auditors here. 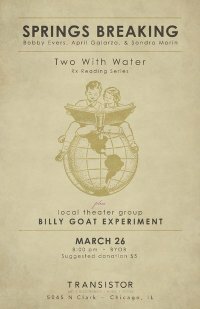 A hip new Chicago literary magazine, Two With Water featured yours truly in their ‘Rx Reading Series” on Friday March 26th at this nifty little gallery/radio station/book store/performance space, Transistor. I read my flash fiction piece ‘Civic Duty,” a wild dream story about an austere general commanding actions of war and glory and sudden realizations about the meaning of peace. Hopefully to be published soon in a literary magazine near you…. An excerpt of my novel, “La Manda” is forthcoming in issue #2 of Two With Water. The excerpt is called “Ghost Games” and will be published in October of 2010. Growing up in a haunted house is challenging enough, nevermind having to deal with the disolution of her parent’s marriage, but then Lucia’s mother decides that 13 is the perfect age to reveal their family’s hidden secrets.